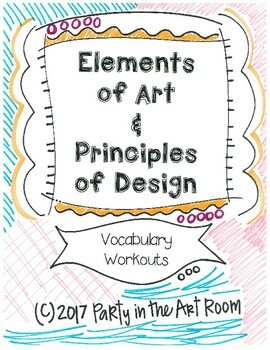 I created some half-page vocabulary sheets for my students to complete and put in their sketchbooks. I plan to have them make a sketchbook out of a file folder and put two sheet protectors inside. I'll have them decorate the outside and staple some copy paper (with the sheet protectors). Then, they'll use duct tape (the cute kind) to seal over the staples and create a makeshift binding. We'll have vocabulary lessons using the half sheets from time to time. They will put these sheets in the sheet protectors for referencing throughout the year as they use their sketchbooks. This is my first time teaching vocabulary in this manner. So, I'll take photos and share as we go. 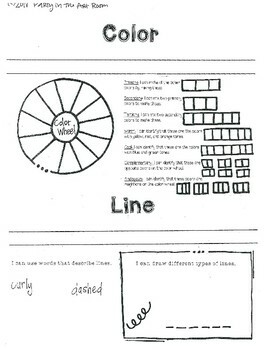 Meanwhile, I thought I'd share the vocabulary sheets in my TpT store. This resource is only $8 in the store.